Welcome to High Tide. Beautiful 7 bedroom beach front home with a private pool. Fully stocked gourmet kitchen. Seating for 6 around the kitchen bar. Open kitchen area. Dining area. Amazing views while you dine. Sit and relax. Comfy seating. Great open floor plan. Amazing views from the living room. Amazing views from the living room. Pool table located on the 2nd floor. Seating are located on the 3rd floor out side bunk room. House has 2 sets of washer and dryers. 1st floor king bedroom with attached bathroom. 1st floor king bedroom with attached bathroom. 2nd floor queen over king bunk room. 2nd floor king master with attached bathroom. Amazing views from 2nd floor master. Room also has a balcony. 3rd floor king master with sitting area. Wake up to paradise. Private balcony off 3rd floor master. Master bathroom 3rd floor balcony off the master. Bunk room sleeps 8. Bunk room sleeps 8. Bunk with with attached bathroom. Double sinks. Bathroom with walk in shower. Bathroom with tub. Private heated pool heat additional fee. Sit and enjoy the day. Great deck and pool area. Private heated pool heat additional fee. Welcome to paradise. High Tide. "High Tide" is one of the latest homes being built by Holiday Beach Rentals Development. It sits directly on the East End of Panama City Beach and is located around popular attractions, good eats, and nightlife. 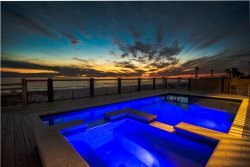 This new, luxury home features a private heated* pool, a beach walkover, an ocean view master suite, outdoor lounge space, and everything else you can think of to make your beach getaway beyond comparable. This beautiful 7 bedroom, 7 bathroom home will sleep 22 guests. Call now to reserve your next vacation! High Tide sits side by side with Away Without Leave, Southern Comfort, and Coastal Luxury. Perfect for large groups.